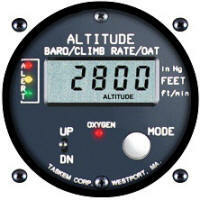 The Series 2000 Altimeter is a "top of the line" instrument and displays altitudes from -1,000 to +30,700 feet in 10 foot steps. It has a custom backlighted liquid crystal display, calibrated barometric reference (Kollsman), audio-visual altitude alert function, vertical speed indicator and RS-232 type computer output. It can optionally be supplied with a Mode C encoder and an OAT/density altitude feature. The Kollsman scale can be supplied in inHg or mBar.